In 2016, American-born artist Lindsay Lawson hosted a symposium on objectum sexuality – a sexual preference in which a person has romantic and intimate relationships with objects. The event was part of her performance “Choreography for Crane”, presented at the site of the Humboldt Forum at the 9th Berlin Biennale. Objects play a central role in Lawson’s artistic practice, which also comprises video, animation, sculpture, photography, print and text. Often her objects appear in virtual settings. At the Thun Ceramic Residency in Bolzano she is currently working on her first clay sculptures. Jürgen Dehm: Lindsay, I have always been wondering about your background and education. Can you tell me more about your decision to make art? How did you start and what happened on the way? Lindsay Lawson: I was a dancer from childhood until my early twenties. I became very serious about it in my teens studying ballet, contemporary dance and choreography, while I also attended an advanced math and science high school. I had a weird asocial dichotomy of a high school experience where basically all I did was study or dance. After a stint in New York, I transferred to Virginia Commonwealth University to study dance while trying to figure out a more cerebral second degree to pursue: briefly philosophy, then film, and finally sculpture. I went on to complete my Master's degree at UCLA in the New Genres program studying with Andrea Fraser, Mary Kelly, Julia Scher and others. Later I studied with Judith Hopf as a guest student at the Städelschule in Frankfurt. JD: You moved to Berlin a while ago. What makes it different to the places you lived before? And has it changed during the time you have been living there? LL: I actually moved to Berlin in 2008. It was November and I came straight from LA with a pathetic "winter" coat and my cat from Compton. Berlin is weirdly slow and it still drives me crazy. People walk like they have nowhere to be and some people slide pretty hard into the laid back, party lifestyle. It's a good city to be based in because it's cheap and full of artists and galleries although it definitely isn't energizing like New York, for example, but since I'm traveling non-stop the past few years it's nice to come home to a big city that feels like an overgrown town. 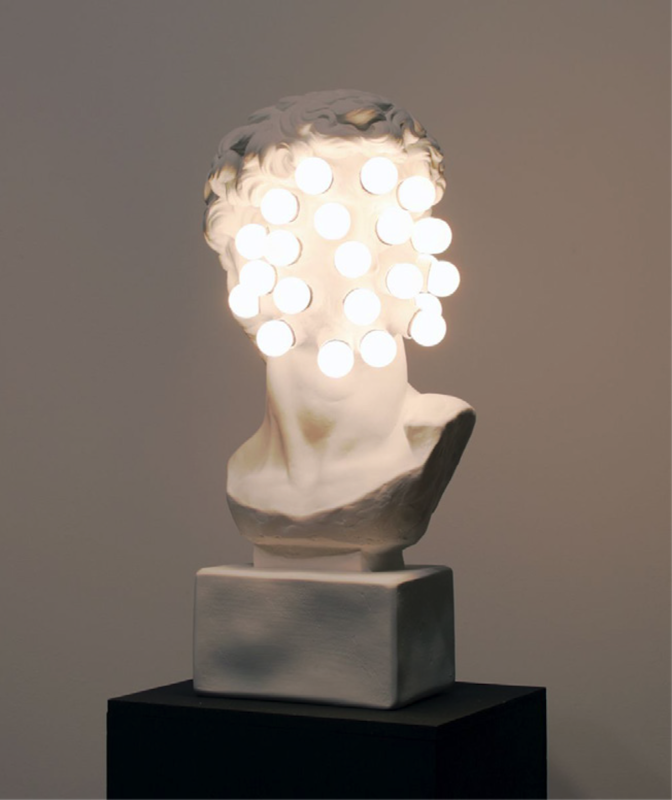 JD: The face of Michelangelo’s “David“ was illuminated with light bulbs in a work of yours from 2008. Is art history important to you? LL: "Anachronism/Lamp" is my first lamp sculpture and was made for a show in LA that positioned the gallery as a department store. Like "Der Denker", it is a reinterpretation of a sculpture that is so famous that the popular iconography overshadows its place in art history. I mean that "David" is a work we've all seen before having actually seen it. My sculpture is a plaster reproduction of the bust portion of Michelangelo's "David," of which there are countless versions for sale as souvenirs, as art, as garden statues, with the face carved out and filled with light bulbs. It was more about the act of reproduction and destruction and the slippage between art, artifact, decorative object, and functional object rather than dealing with the art historical aspects of the original sculpture. JD: And with “Der Denker” from 2015 you made your version of Auguste Rodin’s “The Thinker” from 1880-82. 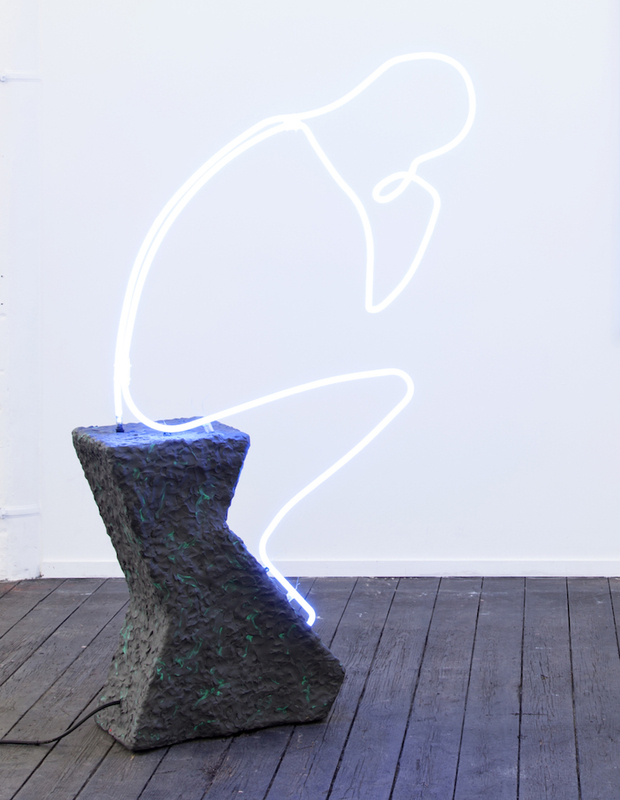 LL: "Der Denker" was my first and only neon work thus far. I'm drawn to Rodin's sculpture because it's the most widely known and reproduced image of contemplation. There are multiple versions of a "The Thinker," some of which were made posthumously, and as a cultural icon it's been reproduced and reimagined countless times. Rodin's sculpture is meant to represent philosophy, poetry, and intellect, but I also see it as an image of inactivity. Thinking indefinitely, but never doing, if he were flesh he would be liberal, but not an activist. JD: Your “Still Lives” from 2016 – inkjet prints of digitally rendered objects combined with digital still lives – follow the art historical genre of the same name, which functions as memento mori. LL: I've made a lot of work about the lives of objects: their contexts, histories, provenance, existence, agency. I've also made bodies of work meant to be understood as a collection, as versions, or as multiples. 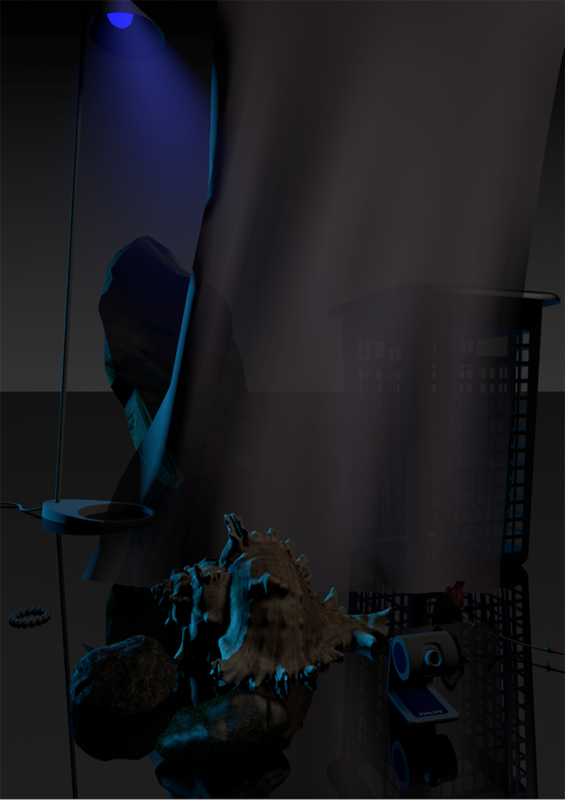 "Still Lives" is based on a collection of virtual objects I have either modeled myself using 3D software, purchased online, or downloaded randomly. I made still life arrangements of virtual objects that are intentionally dissimilar as a seemingly random assortment. The scene is dimly lit and vaguely chiaroscuro, making the objects difficult to read. They bleed into each other, some becoming completely indecipherable, while the darkness makes their digital origin less clear. JD: Another series you made is entitled “The Inner Lives of Objects” (2016). It consists of wall panels and vases with objects fixed into molds filled with resin. 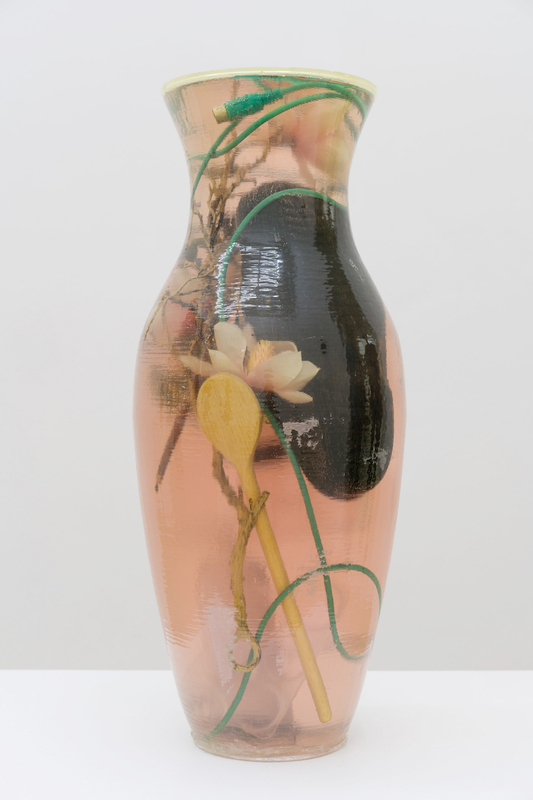 Your “Half-Truths” (2017), transparent vessels in the shape of vases executed with a 3D printer, are filled with water and certain objects as well. 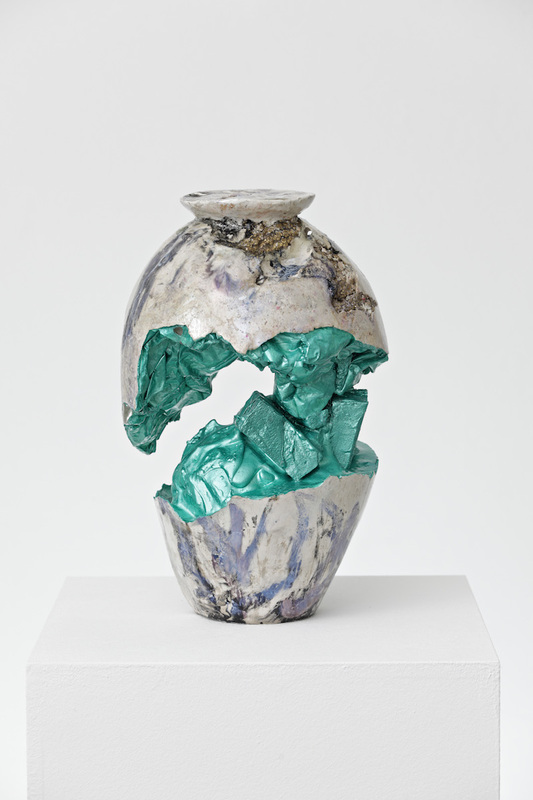 And at the moment you undertake an artist residence at the Thun Ceramic Residency in Bolzano in Italia. Will you move in the directions of a more traditional understanding of ceramics with the works you are executing there? 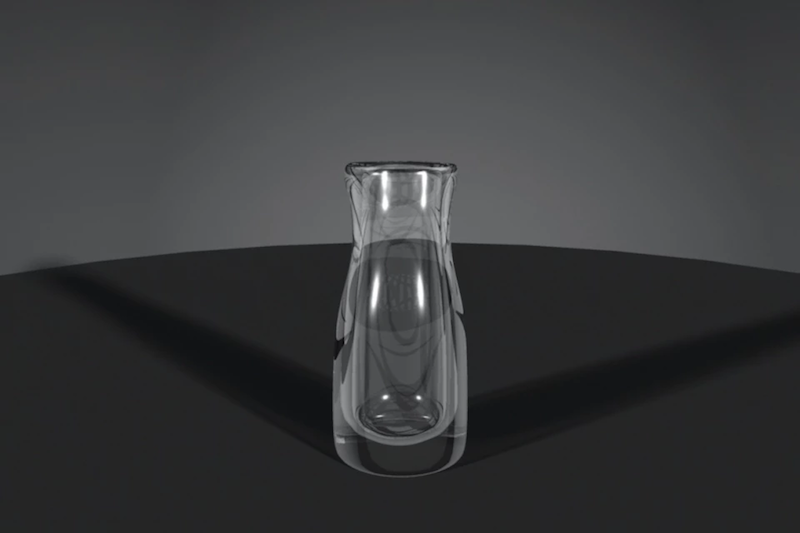 LL: The first 3D model I ever made was in my video "Das Ding" from 2010, which shows a virtual glass-like vase forming itself as if on potter's wheel. I watched hours of YouTube tutorials to learn how a vase would look while it's being thrown on a wheel, but I've never actually made a ceramic vase before. One project I'll work on at Thun is a series of vase sculptures and my initial plan is to see how much the YouTube research can translate into a physical skill and hand coordination. Since I have the opportunity to work with clay in this great facility, I'll be undertaking a number of other sculptural works here as well. JD: Several of your projects take the auction platform ebay as a starting point. Your ongoing project “The Smiling Rock” starts with a woman who falls in love with a rock she found an ebay. In another work you decided to offer personal items of Nick Königsknecht from Peres Projects on ebay for a very high starting price. What is your interest in ebay? LL: Some of the projects you mentioned are what I have termed "Arrangements", which are works that exist as situations, relations, transactions, and often as some sort of contract. One Arrangement involving Nick Königsknecht and his partner, Hannes Schroeder-Finkh, is titled "Significant Objects." I asked them to choose a few of their most valuable things, and to define that value in terms of which objects would be most difficult to part with. I asked that they choose a sales price for each object that would leave them feeling satisfied with the transaction, if it happened. I then collected their items, photographed them, and posted them on eBay. The unusually high prices reflected the personal value of the items for Nick and Hannes. I wrote the item descriptions using a mixture of eBay buzzwords and personal anecdotes from Nick and Hannes to convey the object's value for Nick/Hannes and subsequently for potential buyers. My interest in eBay is mainly as a platform for the creation of value and unearthing potential collectability. Pierre Omidyar created AuctionWeb, the site that would eventually become eBay, in 1995 by listing a broken laser pointer pen that sold for $14.83. Upon closing the auction, Omidyar reminded the buyer that the item was broken and the buyer responded that he was a collector of broken laser pointer pens. JD: Your ebay projects create tension between emotional and economical value in the digital sphere. Is there a connection between the emotional and the digital for you? LL: The digital, in terms of experiences and communication, is increasingly as real and relevant as non-digital aspects of life. I see the presumed lack of physical proximity in the digital sphere as the potential for a new kind self-determined agency. The user has a greater ability to choose how they prefer to present the self and, while lacking some more traditional context clues like body language or tone, they can interpret incoming communication more in line with their world view as a reflection of the self. The space in between our digital selves becomes filled by our own assumptions, fantasies, or logic so much that others may in fact be more like reflections of ourselves. This can sound like a bad thing that discourages empathy, but often this physical distance offers an inverse space of communicating more candidly, almost like speaking to oneself. JD: Can you talk a little bit about your upcoming exhibitions? LL: To put it very simply, my upcoming solo show at Gillmeier Rech in Berlin is about sinks and going down the drain. Then my solo show at Galerie Lisa Kandlhofer in Vienna is about sitting in darkness and ascending towards light.